We can all see patterns of behavior, but that is not to say that behavior follows patterns. This paper is to define a pattern that I have found in the ideas and actions which mankind has used the word love to describe. Any axioms and assumptions I make must be accepted as true for the majority of society. This paper is most certainly not a rigorous proof, however I still want to follow a logical flow, so I need a solid foundation to work from. My chosen axioms are based on what would seem to me, as traits shared by our society as a whole. Traits so common, I’d say they’re ubiquitous and can support the rest of my contention. To state this axiom I must stereotype our culture, as must be done to discuss any large collection of things as a whole. Thus my coming argument can only be valid for the stereotyped portion of society which this axiom applies to. Axiom 1 - People want what they do not have. Seems pretty straight forward. It’s a very widely used phrase which has given birth to many idioms and philosophical quotes – “The grass is always greener on the other side of the fence”, “Have one’s cake and eat it too”, etc. I’m using this declaration in more of a metaphysical sense however. The word ‘have’ in my usage refers to a sense of intellectual ownership. To completely and thoroughly ‘understand’ a given topic (if that is even possible) instills a sense of possession, a custody of the intellectual property. Let’s say I have been taking derivatives since I was a fetus and now I ‘understand’ everything there is to know about derivatives and rates of change. Then in my mind I feel I can do with derivatives anything I please, just as I can do anything I please with this dead fish I’m holding in my hands. I ‘understand’ derivatives, just as much as I ‘have’ this fish. So from here on I’m replacing the word ‘have’ with the word ‘understand’. I know this next claim may ruffle some feathers initially, but give me a moment to justify it. mathnathan - "What do they hate?" hooplehead - "Well, all of it! It's just confusing math, and Greek symbols." mathnathan - "Do they hate televisions, and airplanes, and satellites?" hooplehead - "Well no, of course not. But those aren't physics." mathnathan - "Then what are they?" and the equations behind it." as well. I see what you mean." mathnathan - "Then you'd agree that people at least respect physics." hooplehead - "Hmmm... Yes, this I agree with." mathnathan - "Why do you suppose that is?" hooplehead - "They respect what it can do." mathnathan - "Would you disagree that people as a whole, yearn for power? Whether for selfish, or righteous gains?" hooplehead - "Hmmm, that may be debatable." mathnathan - "Power brings possibility, and that can bring necessities. society, or for the betterment of themselves. Either way, people do yearn for power." hooplehead - "Okay, I'll give you that one." hooplehead - "Well you can't have physics." would want to understand physics." hooplehead - "I suppose they would..."
What happens if people do understand something then? (2) has a truth value so I can apply some laws of propositional logic to it. Axiom 2 - If people do not understand it, then they want it. Notice this says nothing about what happens if people do understand something. This states if they don’t understand it, they want it. That is all it says. so I need another axiom. Again I chose to look at the world around me to find another trait riddled in our personalities, and characters. Music… Everyone has a favorite song. We’ll listen to the song over and over and over. Eventually though, we know every word. We can hum every chord progression. We know the life story of the musicians. We heard the song performed live… And eventually we move onto a new song. Movies… Plays… Art… After it is wholesomely digested we move on to something else. Once we know something entirely, inside and out, then our desire to ‘have’, or ‘understand’ it dies. Which lead me to my 3rd axiom. Axiom 3 - If people do understand it, then they do not want it. There are occasions which may look like exceptions. Humphrey likes this painting so much, that no matter how many times he looks at it, it fills him with euphoria. No matter how many times Gretchen listens to this song it still gives her chills. My theory can explain these anomalies, and I’ll touch on them again at the end. Why did our interest in these physical things die? Their existence, and their complexities are finite. A book is a book is a book. We see a new book that intrigues us, and by (2) we’ve got to have that book. The book can not change though, and once our minds have mastered it’s existence, by (3) we move on to another book. Our desires for things in the physical world follow a cyclical path. Our cycle from (2) -> (3) -> (2) -> (3) continues to spin, we just introduce new infatuations from the physical world to accommodate it. People are not books… Nor are they songs, or movies, or sculptures. Though some people may look like they were sculpted out of stone, fortunately for us they were not. People have a constant ability to grow and learn and their inner complexities can become more and more complex with experience and knowledge. So let’s say we see a person who looks as if they were sculpted from stone and they appeal to us. Just as in finding an intriguing book, by (2) we want this person! We get close to this person, and begin to learn about them. The more we learn about them, the more they learn about us. They become more and more sophisticated with what we’ve contributed to them, and our contributions become more and more sophisticated with that they contribute to us. THIS cycle breaks our previous cycle, and (3) is never reached. From the perspective of an entire planet the life of a living thing lasts no longer than the blink of an eye, and this cycle throughout our history has claimed the majority of many lives. We are no longer interested in trying to understand anything else. This struggle to understand someone matches the ideas and actions that our culture defines with the word love. Which brings me to my definition of love. Theorem 1 - Love is the unending attempt to understand someone. What about when people say they ‘love’ things, or ideas? This theorem leads to an intuitive corollary which can answer those as well. Corollary 1 encapsulates the idea of loving yourself. If you were in a moment wildly memorable, and a particular song was played, that song will stick with you for a long time. You’ll listen to it later on and remember the moment and the feelings that came along with it. Let’s say however that this moment was so impacting that it changed your life. This is like a semi-circle of the cycle of love. This moment contributed to the growth and development of you, so when reliving the moment, over and over, the change that this moment brought to you meets who you are now. So you can “relive” the change and this song will constantly be changing you. With that foundation, I say that through this self reflection you’re constantly trying to understand yourself. 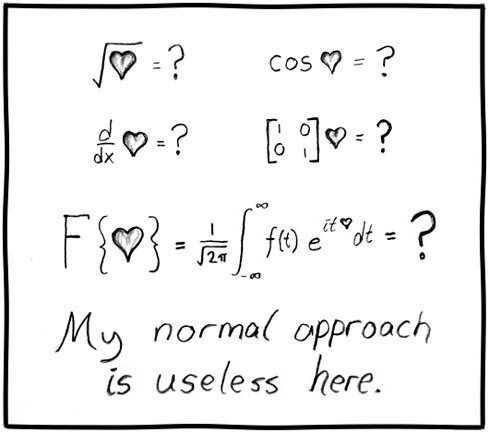 Nathan, this is a very interesting way to define “love”…and very mathematical too. I can tell you really worked hard on it, and that what you wrote is what you really feel about “love.” It’s a very extensive piece, but I feel that you have done justice in attempting to portray to your readers how you view the topic as something serious and not trivial. Superb. You have a hiccup in your logic, specifically surrounding Axiom 1. It becomes increasingly obvious later in your argument as you define around it. It is not as simple as “People want what they do not have.” For instance, I do not have malaria, and I do not want malaria. Even your example of physics betrays a personal bias. There are people who do not want physics. They may want the results of physics. They almost certainly want someone else to want physics. But they do not want the physics themselves. That quality is also necessary to avoid the obvious flaw exposed by extending the argument to the extreme. No person can ever completely understand another person. If you understand some portion of a person, but not all of that person, then, by your argument, you should fall into the loop of loving that person. Consequently, we should all love each and every person we meet. However, this is patently not the case. We need to add another condition. But, it cannot be as simple as “appeal.” That causes the entire argument to collapse into “People want what they want.” However, I think we can manage this without getting too far down into the weeds. Because we are talking about wants, we can safely hedge out needs. We are talking gastronomic delights here, not survival rations. Romantic love, not procreation and furtherance of the species. So we cannot explain it on the basis of physical urges. One common thread is certainly sensual pleasure. But, that does not explain love, either of a good woman or a good book. I do not think we can fall back on some Platonic ideal of “good,” as that would mean that we should all love the same things. For the sake of this argument, let’s simply say, “People want things that will make their lives better.” That could be a sensual pleasure that improves your environment, an intellectual pleasure that engages your brain, or an emotional pleasure that soothes your soul. It’s still a bit circular, but I think it will do for now. Lugh: Your criticism is invaluable! I am both humbled and flattered that you’d take the time to contribute such well constructed ideas to my own. I see exactly your point, and I’m looking forward to tweaking this and making it a persuasive argument. Thank you for your input! Amazing (You + Lugh). Thanks for sharing. I think one analogy (ignoring Lugh’s wonderful addition) is that the first cycle [(2) --> (3) --> (2) --> (3)] is like Z, infinite and unending. On the other hand, the “love” cycle is an infinite and never ending attempt to reach the concrete goal (3); in this way, the cycle is like ℝ ∈ [0,1]. This set is infinite and unending, but it is also a much larger set than Z, or more precisely, ℝ ∈ [0,1] is uncountably large. (And that’s with the limit [0,1].) In this way, love is something that is much more… worthwhile? it has uncountable possibilities, unlike material desires, and yet the cycle maintains a concrete goal. I think it makes sense, but I can’t be sure. And, I’ll bite and throw in another viewpoint… The love that you have defined as an ‘attempt to understand’ intimates a ‘taking’ sort of love, a looking/seeking experience, a romantic looking to be fulfilled sort of love. Romantic love, and love, are often two very different creatures. As you’ll see the Theorem I propose seems somewhat opposite to yours. I’d like to offer the beginnings for a proposal on a logic for love that can be applied to anyone, not just a romantic partner. Axiom 1 – People fear the unknown in other people. Axiom 2 – People fear what they do not understand/accept in others. – If people do not understand/accept other people, they fear them. Axiom 3 – If people do understand/accept others, then they do not fear them. Theorem 1 – Love is the ability to offer understanding/acceptance to others. I appreciate that you read my post, and I’m glad my ‘logic’ had a positive impact on you, haha. When it comes to metaphysical things as complex and intricate as love I don’t think there is one correct way to define it, just a way that makes sense to you. I wrote this post as a way to share my perspective on love and how it makes sense to me. I hope that it may enlighten someone somewhere. Thank you for taking the time to share your thoughts on love, it seems to me that you’ve put much more time into exploring it than I. I do plan to rewrite this one day and the input that you, Dubs, and Lugh have provided will form an excellent foundation for a more persuasive and robust theory. therefor A wife/husband is a derivative of this soul mate and can be defined as the person with the maximum factor closest to 1 out of all people a person has met.